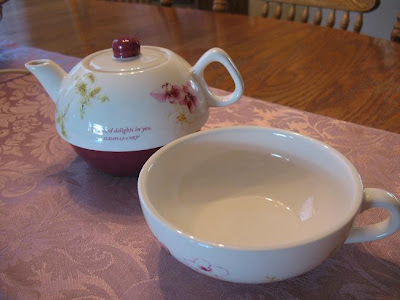 I'm so excited to have another pretty DaySpring tea item to show you! And this time, I thought I should share it with somebody, so I'll be giving it away to one of you - more details below. This is a pretty tea-for-one set. I love these sets because they are the size of a small teapot and can be stored this way, but then open up into an even smaller teapot and a teacup. This one has scripture on it and some lovely flowers, just right for Spring. When you take it apart, the teapot has such a pretty color on the bottom and the cup is wide and shallow. DaySpring is smart to have made this tea set look delicate and feminine while being strong enough to be functional and practical. Wouldn't it be a pretty Mother's day gift? Take a look at it.. Isn't it pretty? One of you wonderful readers will win this tea-for-one set! You're already winners actually, because DaySpring has given my readers a special discount of 20% off your entire order! Just use the code "SPRING09", but hurry - it's only good until Friday, May 1! So, you want to know how you can make this tea set yours?? 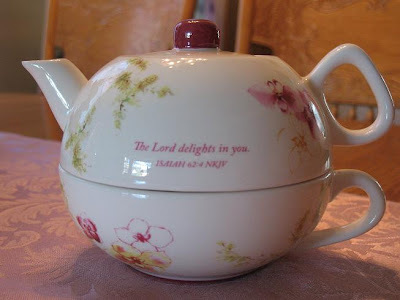 Just leave a comment and tell me whether or not you knew that DaySpring carried tea items. That's it! No extra entries for things like following me on Twitter, subscribing to my blog, or checking out DaySpring - though they are much appreciated! I will draw a random winner on Monday, May 4 and announce it on the next Tea for Two-sday post on May 5! P.S. I'm linking this up to Time for Tea Tuesday at Tea and Thee. Go there to check out some more tea posts or link up your own! Woo! Hoo! How cute is that! And YES, I knew that they carried tea items and a whole bunch of other fun things. I hope you make it home safely my sweet friend. I've been thinking about you and hope all is well!! Big Could I possibly win another giveaway size hugs to you my friend. I love tea cups. The kids and I have tea parties once in a while. And NO I didn't know Dayspring sold tea items. I'll have to check it out. I did know that Dayspring sold tea items. I often look for them for secret sister gifts. I love their items. I knew that Day Spring made gift items, but I did not know they had tea items specifically. This one is very pretty! Sorry, not big on drinking hot tea, but I love sharing with friends and just wanted to say that I think it's great that you are hosting another giveaway. Yes, I did know they sold tea items...but only because I saw it on your blog first awhile back. Thanks for this very beautiful giveaway. I too did know that they carried tea items...but not quite to what extent. The little tea for two is darling! very cute - and no, I didn't know. Any suggestions how I'll explain a package from DaySpring to my Prince Charming? LOL! I came back to see how many entries you had and had to laugh. Carolyn G is workin' it! LOL. I love you my friend. Talk to you soon. I didn't know they had teapots...how beautiful! I can't say that I've explored their line in great detail, but I was at least vaguely aware that DaySpring had tea items. I would love to own this adorable little pot! Also dropped by your blog to let you know that I'll be hosting a bunch of give-aways myself (including a DaySpring necklace! ), May 1-3, at my Virtual Spa Weekend at http://www.InnerBeautyGirlz.com One of our first give-aways to kick off the event will be chocolate, so of course I thought of your sweet blog! :) Feel free to help spread the word if you would like. Better late than never. Yes, I know that Dayspring has tea stuffes. I am also getting e-mail from them. :) Can't wait to see you on Sunday and find out all about your "adventures in moving with Dad." I forgot they carried teapots. I think the tea-for-ones are a delightful idea. I just recently found out that they carry tea items from a post on another blog. I hadn't ever really looked at their website but I've recently checked it out and added a lot of items to my wish list. I did not know until today that they carried tea items. That is such a cute little set.